It’s been a few months working to get this brazen blog off the ground, and of course, what happens? The Nor’easter bug caught up to me courtesy of my handsome husband (thaaaanks, babe). I’m calling it the “Nor’easter” because everyone and their mother has gotten sick around me. Take me back to warmer days, please. 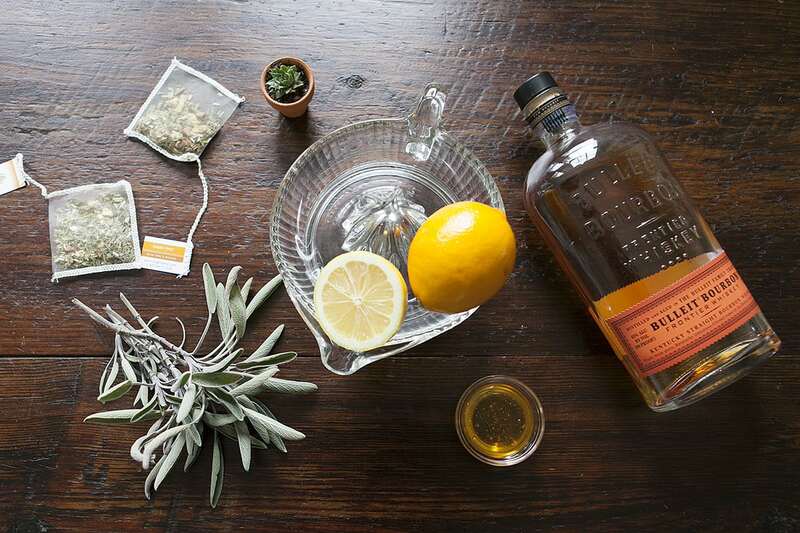 In light of my condition, and at that time brainstorming a new cocktail, it hit me like a ton of bricks much like my ailments: let’s teach the people how to ward off their woes with the best known remedy … delicious tea and booze (let’s be honest, my dream goal was to channel my inner apothecary). 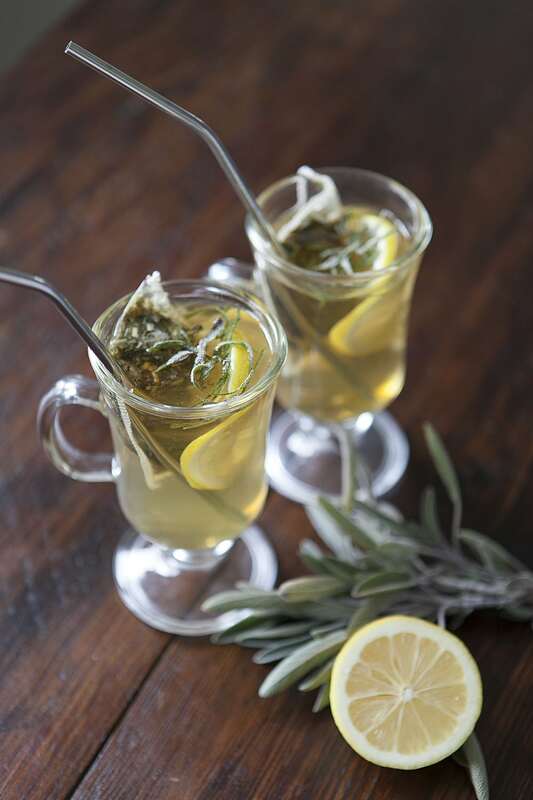 This hot toddy is a worthwhile way to spend your time while you’re flopped helplessly on the couch, patiently resting and waiting for your health to rejuvenate. Thank goodness for green thumbs, the Brigham garden has two bushes of fresh sage growing year-round. Winter sage is wildly aromatic, and I tend to think it’s more pungent than the warmer seasons. A small, yet exciting fact: when our sage was rolled up into a pinwheel to be finely sliced, it looks much like a nautical braided rope – shoreline livin’ represent. Since we got one of our newest, most favorite kitchen tools – a killer mini barista by Breville – I’ve been gradually stocking up on pretty mugs to have fancy coffee in. Irish coffee mugs take this experience up a notch, and it’s a good opportunity to rock the stainless steel straw to avoid gnawing on sage. Boil your water or use an awesome barista machine like ours to make your water hot. Steep your tea per your taste. Add one jigger of bourbon and honey to each glass. Add lemon slices and lightly muddle. 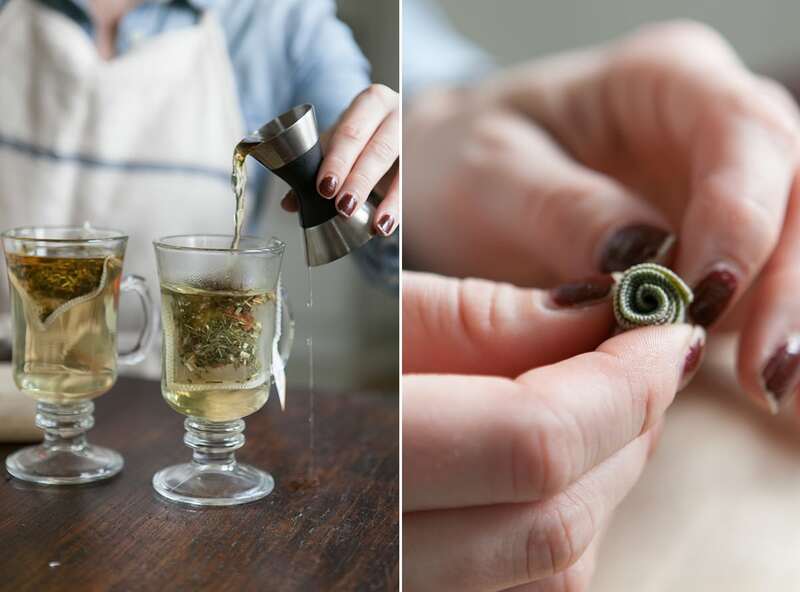 Pile and roll your winter sage into a pinwheel. Finely slice and garnish on top. Let steep for a minute or two. Top off with a stainless steel straw (we got ours at Crate & Barrel!) to avoid masticating your fresh herbs.